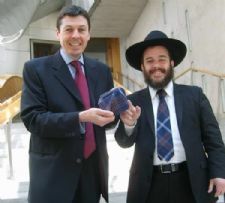 Scotland’s only native rabbi, Rabbi Mendel Jacobs, addressed politicians at Edinburgh’s Holyrood Parliament last week. Rabbi Jacobs, minister of Glasgow’s Shul in The Park, was invited to lead the Scottish Parliament’s Time For Reflection – a weekly address of up to four minutes by speakers drawn from Scotland’s different faith groups. "One of the main distinguishing features of the creation of man is that man was created as a single being - unlike all other species, which were created in large numbers. That indicates emphatically that one individual has the capacity to bring the whole of creation to fulfilment," he told Members of the Scottish Parliment. A record number of over 2,000 attended Passover seders with Chabad in England, Scotland, Wales and Northern Ireland following a coordinated publicity campaign. As well as the interactive and content-laden PassoverUK megasite, which was available for the third year running, Chabad emissaries throughout the United Kingdom joined together to create an advertising campaign in the lead up to the festival. 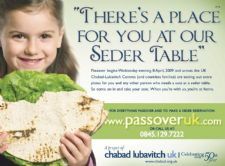 The advertisement, with the tagline "There’s a Place for You at Our Seder Table," provided readers with a link to the PassoverUK website and telephone hotline through which they could find a seder nearby and reserve a seat. Although Passover fell outside universities’ class schedules this year, campus-based Chabad-Lubavitch centres throughout the United Kingdom still had overflowing tables for the traditional Seders, with approximately 800 British Jews and Jewish visitors attending communal gatherings from Edinburgh to Leeds. Heavy clouds and rain looked set to dash the hopes of Jews gathering in London and Leeds wishing to celebrate the once-in-28-years mitzvah of birkat hachama - thanking G-d for the sun as it returns to the position it occupied when it was created. However, by 8am on April 8th, the skies had cleared leaving London "basking in sunshine," says Rabbi Levi Sudak, director of Lubavitch of Edgware. The London ceremony, which took place in the grounds of London’s historic Kenwood House, attracted Jews of all ages and backgrounds from the immediate area and across the capital. The proceedings were led by Rabbi Levi Sudak and accompanied by the cantorial talents of Chazzan Avromi Freilich of Hampstead Garden Suburb Synagogue. For its third year running, the interactive and content-laden PassoverUK website is once again available to Jews across the UK in anticipation of the coming Passover festival which begins on Wednesday April 8th. The UK website was the brain-child of Rabbi Reuven Leigh, director of Chabad in Cambridge. 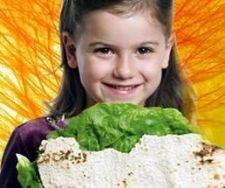 “A significant number of people used the site in the past three years to find a place at a Passover seder, sell their chametz, buy matza and learn more about the festival,” says Rabbi Leigh.